The front and back of Malabar’s 2018 “No Excuses” shirts and sweatshirts, shown above, were designed by student Gage Stephens. 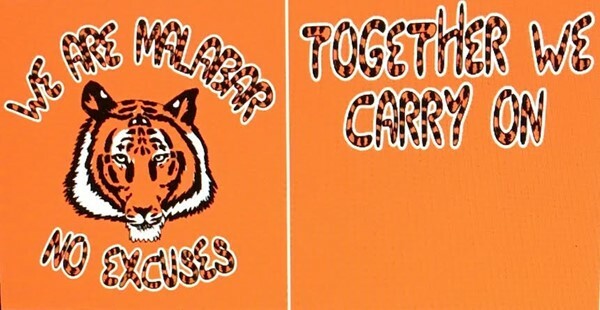 Clothing can be ordered until Nov. 16 by going to tygerpride.com and scrolling down to Malabar Intermediate under the schools heading at the top of the page. Sixth-grader Gage Stephens, who likes to draw dragons and his own cartoon characters, created the winning design for the 2018 version of Malabar Intermediate School’s “No Excuses” shirts, sweatshirts and hoodies. Intervention specialist Dawn Cole said students at all grade levels – fourth, fifth and sixth – submitted entries they made in art classes over a three-week period. A tiger face seemed obvious, he said, recalling the tiger paw prints on the sidewalk at Sherman Elementary, where he attended before moving on to Malabar. And, he said, tiger images are common at Malabar. “And then I thought, ‘Hey, I can do the lettering in tiger stripes,'” he said. Sure enough, those stripes adorn the letters on all of the words, front and back. Cole had high praise for Gage beyond his talents as an artist. “He’s a great kid. I believe any teacher here who knows him would say the same thing,” she said. For his winning entry, Gage will receive a free Malabar hoodie when the new ones arrive. Orders can be placed until Nov. 16 by going to tygerpride.com, then scrolling down to Malabar Intermediate under the schools heading at the top of the page. Click on the link below the orange shirt.